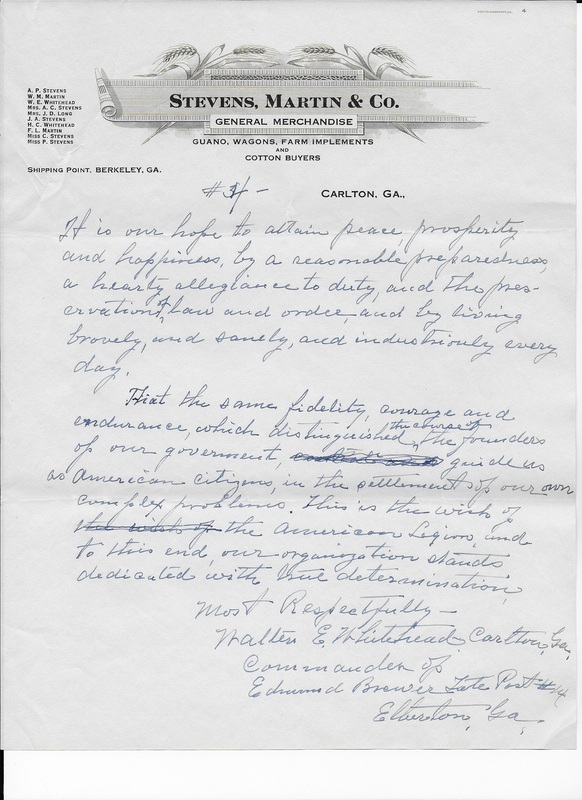 My great-grandfather, Walter Everett Whitehead gave a lot of speeches during his time in both political and civic arenas. I have written about him on this blog several times. When my cousin Sara allowed me to take the “Whitehead Box” from the beautiful family home in Carlton, I promised that I would put the information to further our exploration of our ancestors. As such, I am the keeper thousands of his written words. Unfortunately, he often did not date his writings so I am not able to date them precisely. But for the sake of our family, I wanted you to know some of his words. I plan to translate his words from his hand to the computer. I will date when I can. I will provide context when I can. Otherwise, let’s just read his words. 2- We endorse the extension and not the restraint of individualism. 3-We will encourage proposals lending to make home owners and not tenants of the rising generation. 4-To sponsor and support baseball and other helpful athletic activities. Preventable diseases, poverty and inadequate living conditions, shall have our constant consideration. Chloe wrote: Wrote to soldiers he helped draft. 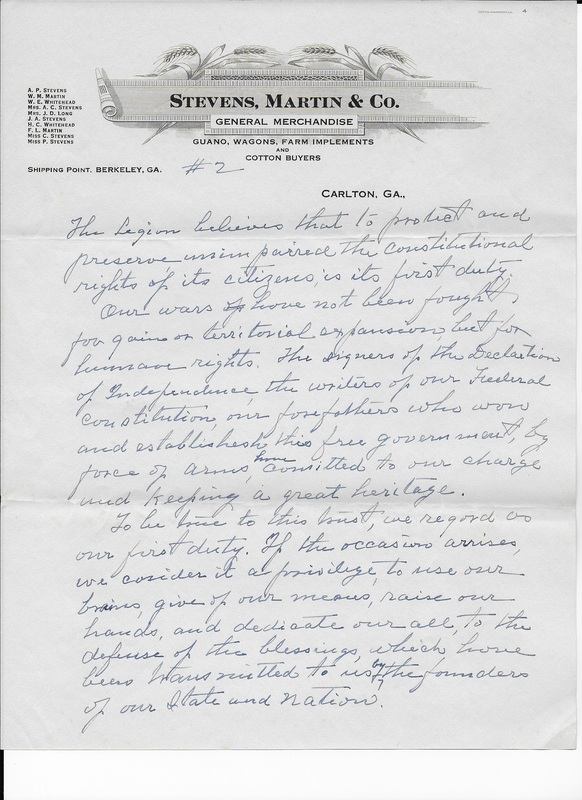 This was written on The State Senate Letterhead, so it was likely written during his time in office. Maybe he was on the campaign trail. *Doubtful doctrine of working less and having more? *Not appeal to class hatred but self-exertion. *Courage to seek and speak the truth with the low of our being-no hostility to new views. *Willing to work are honor & glory. Men are not as we would have them. We must take them as they are. At death in 1799. Plans of crops were found written out for 1800-1-2 &3. Childless-often the children of the great are mortifying, seldom edifying. The treason of Benedict Arnold often Valley Forge. Laid corner-stone of Capital Sept 18 1793. 64 years in building, cost $26,000,000. I will continue to explore his writings. But, I want us to reflect on what a Patriot and progressive he was. His words still resonate today. I sure wish I could have sat upon his knee and listen to him talk. Until later, I will keep exploring backwards! During my last visit to his home, my cousin Sara allowed me to bring home this box of Whitehead artifacts. I call it that because while it pertains to my family, it is also a part of the American Story. Take for example this letter to the editor, dated 24 December 1934. Walter wrote this letter to the Athens Banner Herald in response to a news article they had run. 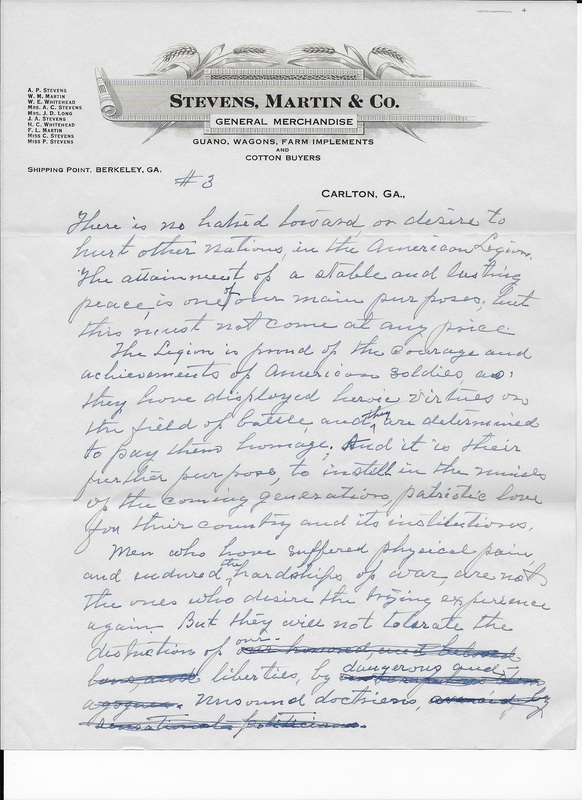 In this letter he exudes Patriotism. I am going to give you a few lines here, and then let you read the rest in his own handwriting. Walter was a leader of men. Recall he was a Georgia State Senator on two occasions. 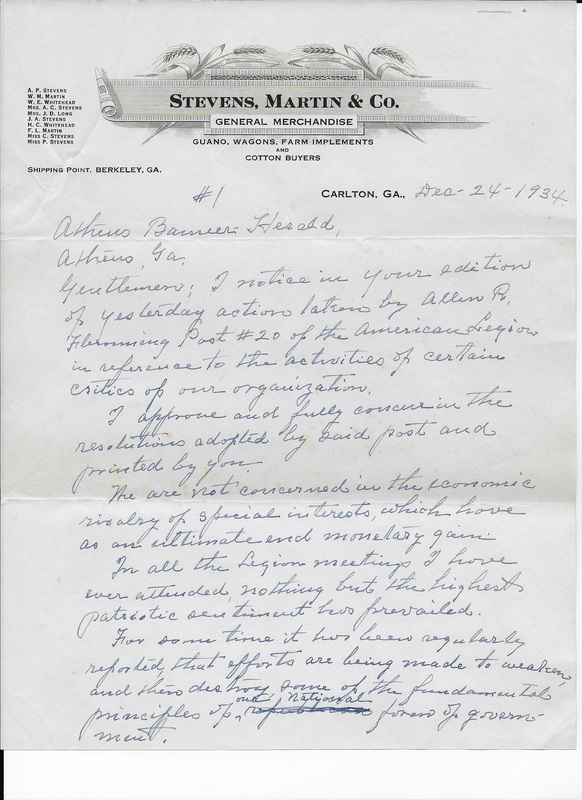 He was also Commander of his American Legion Post, Rotarian President, Quartermaster, Major, Business Leader. He also found a way to serve his country in three wars. There are more speeches in this box, I will post some more later. Additionally, please look at the members of the Stevens, Martin & Company. This is the first time that I have seen my 2nd great-aunts, Cynnie and Pellie Stevens on letterhead. I have heard that they helped the family immensely and neither of them ever married. Family if you have stories to add, please feel free to comment here! This is why I do this. Until then, I will be exploring backwards.